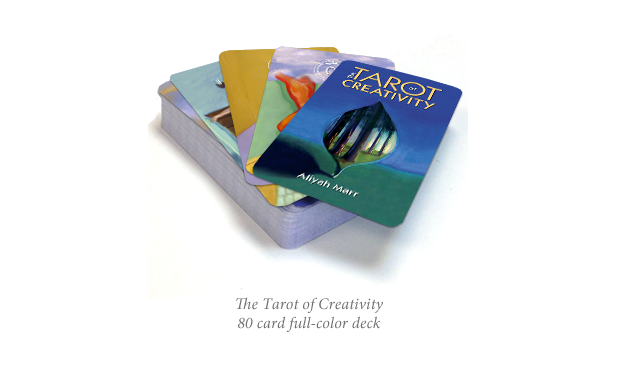 The Tarot Cafe is a friendly place where you can buy positive Tarot readings, tarot decks, and creative activations by creative coach Aliyah Marr, author of The Tarot Key, DIY Tarot, and The Tarot of Creativity. A 1-card reading is designed to answer yes/no questions and give you additional insight on any issue. I send you the reading—picture and text— via email. Quick “yes/no” 1-card readings to help you clarify issues and help you make quick decisions. Available in several packages. Via email. A 2-card reading designed to help you see things more clearly and make decisions. I read from two decks: I draw a single card from one deck and match it with the corresponding card from the other deck. This gives me tons of insight. I send you the reading—picture and text— via email. Great for general reading or for any specific question you may have. A 3-card reading is a quick way to get lots of information about where you are right now, what might be coming in the immediate future, and guidance on how to proceed. Via email. This spread will show you what is happening for six months in your future allowing you to have time to prepare to be in the right place at the right time. This tarot reading is like a compass for your life. Read below for more information on what tarot readings with me are like. This spread can be started at any time of the year. With one card per month, it goes into how the course of your incoming year will turn out. Will you run into some financial trouble in May? Will you find love in December? It’s always so interesting to see what the cards pick up! This reading tells you where you are right now, and offers advice on how to proceed. Have you ever wondered what you were in a past life? Were you happy? What was your profession? Who was your soulmate? Are elements from that life still operating today? A Celtic Cross reading for your past self. Your life in 365 Degrees: a reading for every area of your life. This complete, life-path reading gives insight for every house in the astrological chart: work, relationships, family, love, career, creativity, home environment, aspirations, etc. In this reading, I discuss the current trajectory of each of these areas, and, if necessary, how to proceed to achieve optimal balance. By phone. Give yourself or a loved one the gift of creative activation! Monthly subscription = four detailed tarot readings per month and ongoing contact via email and text. Includes additional quick decision readings (1 card yes/no readings)—4 per month. This coaching package allows the greatest amount of creativity and higher guidance to flow in your life. By phone, email, and text. Monthly subscription. I am a creative consultant and coach; I specialize in helping creative people achieve their dreams. I offer private sessions through phone, email, WhatsApp, VOIP, and Skype to assist you on your path. I have worked with many people, in many capacities. In our session, you can discuss your life direction or specific projects or goals. We can discuss your projects, go over your ideas, and resolve any blocks that you may have. Good for business people, entrepreneurs; creative folks in any media or life-path. Brainstorm with me! My deck, The Tarot of Creativity. The Tarot can be used as a tool to gain "inside information" on our subconscious thoughts, dreams, and desires. The images, symbols, and archetypes in a reading allow us to gain access to information stored deep in the right brain. * In psychological terms, the Tarot can help us connect with levels of our consciousness that are often hidden from our daily awareness: the subconscious current of desires and needs, as well as the wisdom and all-knowing nature of the superconscious. What I really love about the Tarot is that it gives me a way to communicate with the desires and intent of your inner self. The Tarot gives you a "snapshot" of where you are now and a glimpse of the way forward. Through the images in the cards, I help you engage with your inner self to see what you need to know and how you can proceed. I help you choose your path and advise you on how to best manage your energy so you can achieve your highest aspirations. When you get a tarot reading you engage in a partnership with the reader. The reader has a duty to give you the most positive Tarot reading that she/he can. What is a Reading With Me Like? I work with my own Tarot of Creativity deck and with the Rider Waite Smith tarot in what is called a "comparative tarot" technique, which blends the meanings from both decks. You can be assured that my readings are informative, gentle, and insightful; you are encouraged to step into your highest aspirations and live the life of your dreams. Many famous successful people owe the timing of their success to the kind of "inside information" that the cards can reveal. The Tarot can be read from many different levels — from simple divination to higher-self connections and personal development. I developed the SEER™ technique for reading tarot which I outline in my two tarot books, The Tarot Key, Unlock the Secrets of Your Soul and Do It Yourself Tarot. This technique shows how energy is flowing in a spread. I often use numerology in conjunction with the Tarot as a way to "sum up" the ultimate meaning in a reading. Carl Jung once said that if he were condemned to solitary confinement and could bring in only one object, he would ask for a Tarot deck; implying that the wisdom of the universe is contained therein. Some of the cards from my deck, The Tarot of Creativity. Buy the deck HERE. The right brain is more image-based: the reader interprets the right-brain meanings of the pictures, symbols, and archetypes of the cards with her language-based left brain. Surprising insights and intuitive hits result. The reader and the querent (the person being read) are in a partnership; a willing collaboration to find the questions hidden in the subconscious and to access the wisdom of the superconscious. Is a Tarot Reading Accurate? If you were to have a daily Tarot reading it would tell you something different each day. I once kept a journal of my readings for a year. Every month I would do a six-month Tarot reading: the last month, current month, and for four months in the future. The events "predicted" in each reading were accurate, but the timing of those events would change as time progressed. *For entertainment only. Tarot should never be taken as a prediction of future events; it is more fluid than that. Tarot can only tell you how you feel about something and only predicts according to your own thoughts and beliefs.